Home > Uncategorized > A tough one, Part 1…. A tough one, Part 1…. Today was a major milestone for me, Paddy and the project. 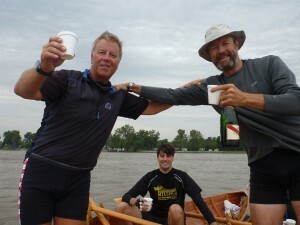 After the first 6 miles, we reached halfway to New Orleans and we celebrated with a bottle of champagne, shared with James Whitworth, who was rowing with me, and his girlfriend Olivia Cazenove, who was steering us, plus Stephen Gillespie and his daughter Maeve, who were with Paddy. The rest of the day will be part 2, but before you all decide that I am a grumpy curmudgeon, I will share with you a letter from our good friend Dave Davies of Hannibal, Missouri, the worlds’ happiest undertaker and who brought us a couple of presents to help us on our way. I just thought you might like some Missouri cheese from our Amish friends. Notice the great price sticker! They are the most faithful and hard-working folks you could ever meet. 6 Most important – never operate machinery after or during consumption. Can’t wait to see the photos after drinking. Absolutely brilliant. Apologies for repeating myself, but what wonderful people you have met. I believe from a friend who lives in Virginia, the Mid-West folk are great. Great work guys you are now on the home run, I suppose Paddy will want to row the Woody Point races from here. Uh oh. I have been sponsored by someone for my stretch with you based on an amount per mile and an amount per drink on each of the evenings before rowing . I think I’ll stick to Samuel’s finest ale rather than this moonshine. Until I have finished my stretch that is..